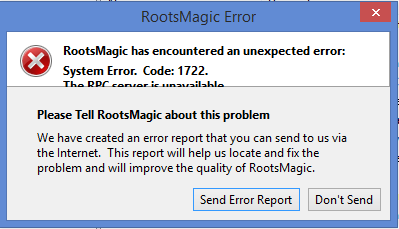 I have sent error reports, but how do I fix this on my RootsMagic 7 software? You might have to wait for Tech Support after the long weekend. Meanwhile, you could try File > Database Tools from top to bottom. If that fails, try reinstalling RootsMagic. That is a Windows Print Spooler error. You can Google that error message to find ways to fix it on your computer.